He said he misses my stories. I rolled my eyes and almost immediately spat out the most insulting phrase ever, I Know, Right. It was sarcastic, of course. As a blogger–sort of–I’m not really sure if people really care about what they read, especially when posts are overly dramatic and that there are more important issues in the world apart from my own thoughts. Abandoning my blog for a few months isn’t exactly a deliberate step to get over the ‘adventurous life’ I left behind and stop regretting my decisions. For some reason, things have not been kind. Or that I am simply not kind enough to myself. Either way, it’s been tough. I stopped writing because–just like that–nothing inspires me anymore or at least, I haven’t been motivated to write. I’m the type of person who can write about dirt if I can make something out of it but not even my most interesting moments the past few months (definitely more intriguing than dirt) were able to make its way to me and be transformed into words. Logging in to my account is a struggle, let alone write something. Anything. …Somehow the word about some makeup hobbyists from UPLB offering their hair and makeup services got out, and Ate Sheryl and I found ourselves reveling in an experience of a lifetime. Two years ago, I pledged to myself that I would grow out my hair and upon reaching my waist, I would cut the whole chunk of it and donate it to an organization dedicated to creating medical wigs for cancer patients. But since my insecurities ate me up more than my pledge, I failed. I bleached my hair to a shocking rusty blonde and it dried to the tips after a month. I guess it’s more rude to donate damaged hair than to back out on my word. When I cut the animal hair off my life in December, I was still in the middle of figuring out what I would do to compensate for my wrong decisions. One day in January, my Mother–last semester’s executive producer of a local television show of their college–was telling me about her day and how her guests made an impression to her. She was telling me about this ‘group’ who get together every Valentine’s Day and ‘beautify’ themselves for the day. I was about to brush off the idea when she mentioned that they are, in fact, cancer patients. I was moved. Not only because they are cancer patients and that I finally found a way to compensate for my botched hair donation but because I felt deep in my heart that our art can mean something for other people. Even for just a day. Armed with our signature pink traincase, Ate Sheryl and I arrived at Madre de Amor Hospice Foundation on Friday the 13th of February (Ate Sheryl is engaged, so her Valentine’s Day was booked) at 8 AM and there we met the strongest people we have known. No, they are not just a group who get together for Valentine’s Day. They help cancer patients help each other during these trying times. 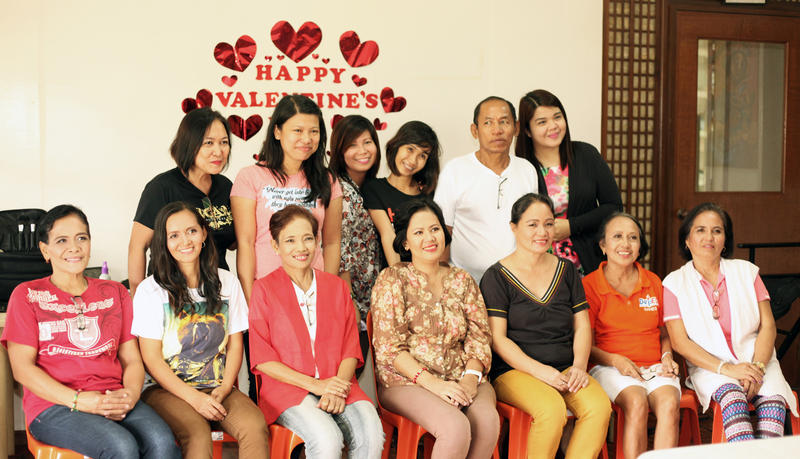 They are some of the women from Madre De Amor Hospice Foundation in Los Baños, Laguna. They are called mobile cancer and dialysis patients who get together to build a support system with and for people who can relate to their own plight. They do fun activities together; share stories, progress, struggles, loss. They were no celebrities but the glow that radiated from their faces was priceless. I don’t think any amount of cosmetic surgery could give them that, it’s not even the makeup. Their spirits were warm, bright and alive because of the happiness knowing that there are people around to support them; the optimism that everything is going to be all right for them and their peers; and that strength, that strength that not even cancer can beat. These women were my inspiration in writing a speech for Toastmasters International. Their strength is silent but profound. The day that Ate Sheryl and I spent at Madre de Amor became one of our most unforgettable walkabouts in our lives. Our makeup gig might not have been located in another province, or in another country–it wasn’t even with famous people. But they are all what we needed to see that life is beautiful. No matter what. And I should remind myself of this. Every day.